notes on the cd inlay there is a picture from the Raji's February 15th, 1990 concert, so the album was released on cd at least one year after the vinyl and cassette. 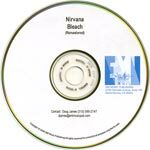 titles and compact disc logo printed in white ink on the cd. only the sub pop logo is printed in white ink on the cd. the titles are unprinted and the metal shows through. no compact disc logo. 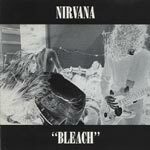 released from 1992 on. 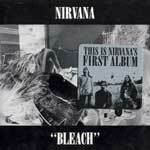 these cds have a glossy black ink background, and 'digitally remastered is printed under the sub pop logo. some copies are housed in a long card box. the photo on the back has never been used on other releases. red and yellow sticker on the front. 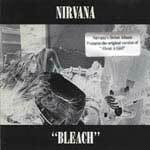 variation mispressing, has the bleach graphic printed on the cd but plays disc 1 of the compilation "best of nrg for the '90s, vol. 4"
notes from the "about a girl" sticker on the wrap it can be stated that it was released in 1994 after the "unplugged in new york" album. all albums advertised on the included sub pop mail order card were also released in 1994.